A new study from Neil Thurman and Richard Fletcher, “Are Newspapers Heading Toward Post-Print Obscurity?“, looks at what happens when newspapers go digital-only, using the case study of The Independent, which stopped printing in 2016. It serves as a warning to publishers, stating that time spent reading The Independent dropped dramatically when it went online only. With some caveats, namely how time spent on print was measured, we do believe this study has value in highlighting the need for print and digital to work together, and not compete against each other. For publishers preparing their 2019 budgets and strategies, three key lessons stand out. We all know that print subscriptions are decreasing over the years, while more and more readers get their news from digital sources. 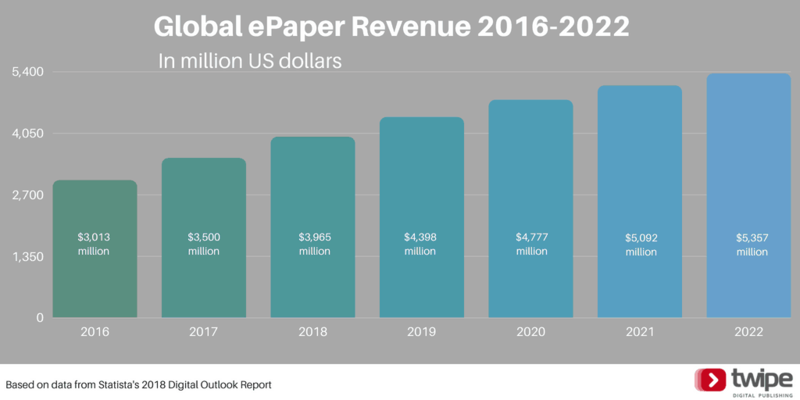 However what is very interesting is that ePapers, the digital editions of newspapers, are part of this digital growth, with Statista projecting that global revenues will show an annual growth rate of 7.8%, to result in a market volume of $5,357 million by 2022. Europe is expected to grow even more, with an annual growth rate of 8.5%–with a much higher average revenue per user (ARPU) than the global average as well: $50.42 versus $30.11. Certain European countries stand out for higher ARPUs, mostly in the $70 range (Germany, Ireland, and France), while the UK stands out for an ARPU of $92.70. While this is all great news for publishers who have a strong focus on their ePaper, this growth doesn’t come at the expense of print. Earlier this year, British weekly The Spectator’s announced that their print sales had hit a 190 year high, which they credited to their digital strategy. Visitors to The Spectator’s digital edition can read 2 articles a week before being invited to subscribe for full access. Of those that subscribe, the vast majority pick the print and digital package, at £12 for a three-month trial. Such subscribers, who may have thought they never would have got into the habit of reading a print weekly, end up hooked, with most trial subscribers moving on to the full subscription. In short, the digital bundle is an aid for driving new print subscribers, not a threat. Additionally, a recent study has found that print-oriented subscribers have digital reading behaviours as well. 38% of subscribers who described themselves as primarily print users also visit the newspaper’s digital edition. One of the key lessons for subscription conversions is that mode of news consumption is not set in stone. A study from The Media Insight Project found that media consumption habits can change based on life circumstances, and even go against previously stated preferences. From our seven years in the ePaper industry, at Twipe we’ve seen that ePapers are a strong loyalty product, helping to deepen reader loyalty for the whole product offering. Subscribers with both print and digital access are more likely to continue their subscription, in part because they are able to use the digital edition to supplement their reading of the print newspaper, such as when they are traveling. That is why it is key to first know your most loyal and engaged readers, and then design products for them. Ken Doctor calls them your ‘7 percenters’, as in the 7% of readers who drive 50% of your site’s traffic, while Robbie Kellman Baxter refers to them as ‘super users’ in “The Membership Economy”. There’s still a perception in the industry that ePapers are “dusty“, something that some publishers feel they have to have, but don’t invest in at all. This is surprising considering the impact ePapers can have on the whole product offering, including print. During our research into the US market earlier this year, we were also surprised by how often we heard ePapers referenced as something only for an older generation of readers. 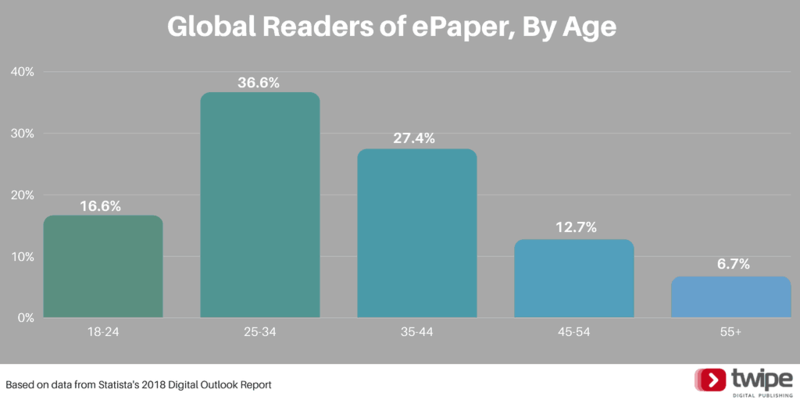 While it seems almost too good to be true, surprising research from Statista shows that globally 53.2% of ePaper readers are under the age of 35. Reaching a younger news audience is a key need for many publishers, so it is highly probable that ePapers will only continue to grow in coming years. It is clear that there is more room for data gathering from your digital readers than from your print readers. This doesn’t mean however that you can’t use your digital edition data to improve your print edition. Canadian daily The Globe and Mail did just this with their most recent print redesign. Using their online analytic data, they saw that opinion pieces were the most popular content so they brought their opinion section into the A section on weekdays and extended the opinion section on weekends. They also found that readers have a preference for content from Globe staff, over freelance or wire content, so those stories now have a larger emphasis in the paper’s layout. We’ve seen European examples of this as well. Belgian regional L’Avenir used EngageReaders data from their digital edition to determine the order of the sections in their print edition, particularly to determine if the regional sports section should come before or after the national sports section. German daily Aachener Zeitung also uses EngageReaders, with Ulrich Kutsch, Chief Digital Officer, explaining that they use the data to better understand their readers in order to decide their focus for both print and digital. 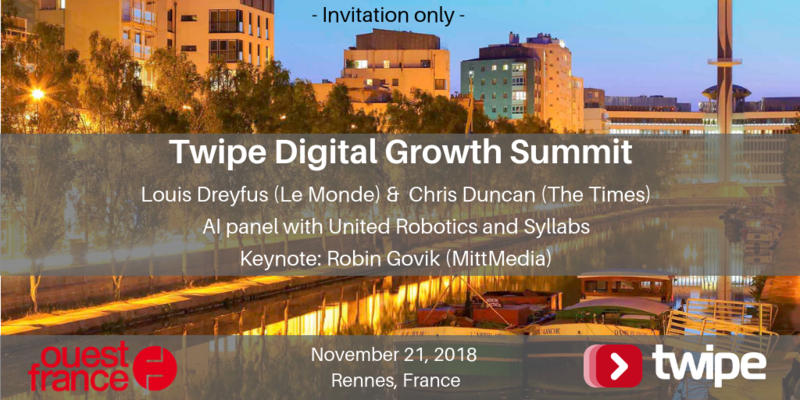 More on these lessons, as well as an insight to how leading publishers are planning for 2019, will be a key topic of the CEO Panel at the Digital Growth Conference in Rennes, France on November 21. Join us for an illuminating discussion between Louis Dreyfus, Le Monde CEO, and Chris Duncan, Managing Director of Times Newspapers. Republished with kind permission of Twipe. The original article can be found on Twipe’s blog.